The Red Sox signed OF Rocco Baldelli to be their 4th OF this week. I like this signing for the Red Sox, because Baldelli definitely has the talent of a starting OF, so to be able to play him when need be is definitely a positive. I think he might play some CF against lefties in place of Jacoby Ellsbury and will probably fill in for J.D. Drew whenever he gets hurt like he usually does. 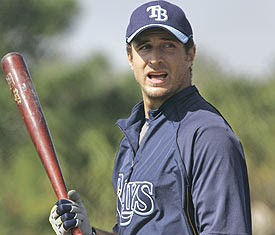 Hopefully Baldelli will be able to stay healthy for the full season.